Rotate your Samsung Galaxy Tab 3 7.0 P3200 through a full 360 degrees to portrait or landscape position with this fantastic looking leather case with stand so you can watch your favourite movies, view pictures, surf the web, and check important emails - all handsfree. 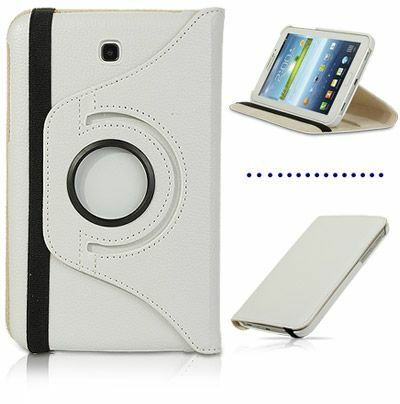 The swivel mechanism of this leather case allows your Samsung Galaxy Tab 3 7.0 P3200 to rotate horizontally or vertically depending on your viewing preference. This multi-functional case is made from durable exterior leather with soft inner layer which protects your Samsung Galaxy Tab 3 7.0 P3200 against scratches, smudges and sudden bumps. You can now preserve the new look of your tablet, provide impact & shock protection and keep the compact dimensions with this fantastic looking case!